Santa Claus (also known as "Santa", "Saint Nicholas", "Saint Nick", "Santy", "Kris Kringle" or "Father Christmas") is a figure who distributes Christmas presents, especially to children, on Christmas Eve. Prior to Christmas, children often write letters to Santa, wishing him a Merry Christmas, and often containing a Christmas list describing the presents that they would like to receive. Good, nice, well-behaved children, get nice presents. Naughty, badly-behaved children, may get nothing, or undesirable presents, such as a lump of coal. 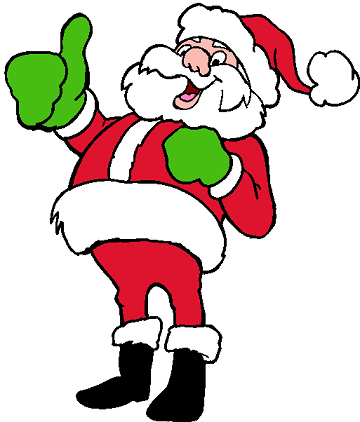 During the year, Santa Claus reportedly lives at the North Pole, with his wife, Mrs Claus, and his friendly elves. There is always lots of work to do in the run-up to Christmas, such as reading children's letters, and preparing presents. Many of the presents are prepared and wrapped by the elves who work Santa's workshop. On the night of Christmas Eve, Santa Claus delivers presents all around the world. He travels on a flying sleigh pulled by nine magical reindeer. 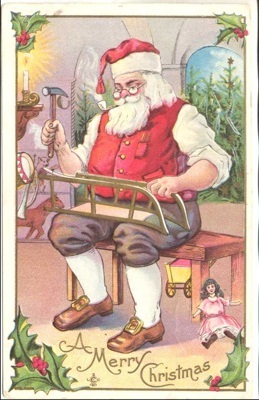 Upon arriving at each house, Santa enters, often through the chimney, and leaves presents in a Christmas stocking or under the Christmas tree. In return for the gifts, it is traditional to leave some refreshments out: mince pies or cookies, with a glass of drink, for Santa Claus, and some carrots for his reindeer.